Directions: From Philomath head west on Highway 20. At about four miles, the town of “Wren” is on the right side. Take the right to Wren (Kings Valley Highway,) then immediately take the next right to Wren Road. Take the next right, which is just before the train tracks on to Harris Road. 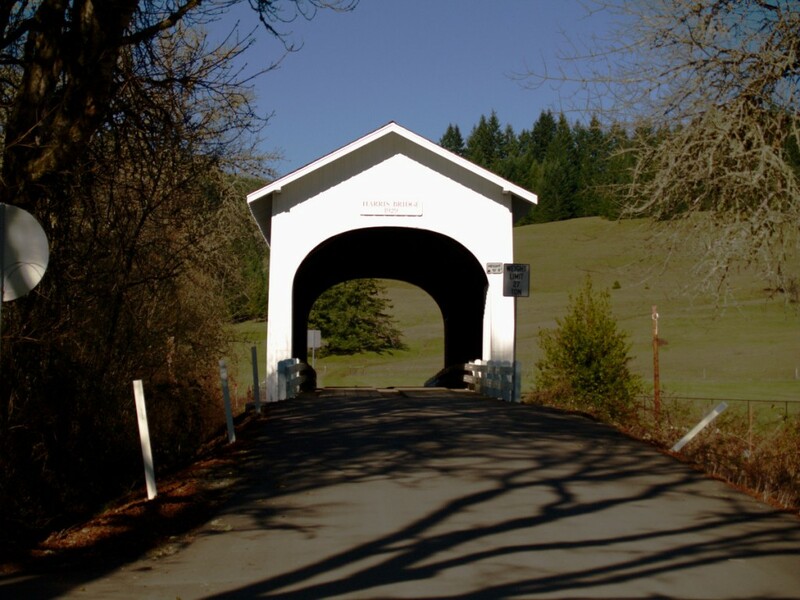 The former townsite of Harris is marked by the Harris Bridge Winery and the Harris Covered Bridge. Harris was a small community that formed along Mary’s River near Charles King’s property. The first known settlers here were George and Elizabeth Mason. They came from Ohio and Kentucky before settling here in 1855. 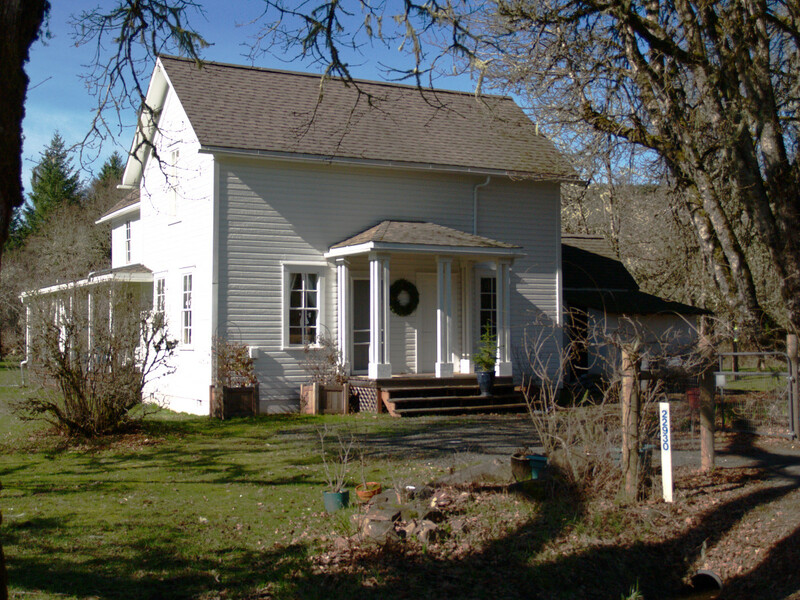 Their property was assessed at $1000 in 1865. They sold the property for $2000 in 1866 to John Akin who later in turn sold the property to Charles King in 1869. Sometime between 1866 and 1869 the house now known as the Charles King House was built. Stylistically, the house looks like it was built in about 1869-1870 because of it’s balloon frame construction. Family recollections back this up. But, it has two doors, one entering directly into the kitchen, and another entering directly into the parlor which would have only been used on Sundays and special occasions. This style was prevalent in Kentucky where the Masons came from, and would explain the doubling in value of their land in one year if it had been built in 1866 instead. Charles King later built a sawmill nearby. In 1880 he added an two story addition to the house, giving it an “L” shape from the rear. The extra space was to provide housing for workers from the railroad that was being built 100 feet away between Albany and the Oregon Coast. Nearby neighbors also built a house for the same purpose, using wood from King’s sawmill. Construction of the current covered bridge started in 1936. It was built to replace another covered bridge at this location. Locals say that construction actually started in 1929, so it’s possible that was the construction date of the first bridge. All that remains of Harris today is the Covered Bridge, the house, and a scenic drive. The Harris Bridge Winery opened up a few years ago brings a few more visitors to this gorgeous piece of the county, but other then that, it’s a lost community.